Making Money Online: Earn $1,000 to $5,000 Per Month With Less Than $100 Invested. Someone once said "A man is a thousand parts, all of them other people, people he met along the way" I agree with that statement with one addition, that there is a part of that 1,000 that is intrinsically just him. For me, I think reading comes to mind, I truly love to read above all else. Then you can throw in travel, writing, arts, and all the other stuff. Making Money Online was written with the purpose to help others make money online within a week of effectively starting. To avoid the mistakes I have made as well as many other people have made and continue to make to this day when it come to making money online. It was written to help the average person identify their skill sets, strong points, things that need improvement and how to device a plan and monetize those skills. Above all, to be able to generate extra income online with less than $100 invested. All the so called Gurus talk about making hundreds of thousands or more from Internet Marketing or Multi Level Marketing. They however, leave out the part that buying in will cost you a lot of money, they bait you with a low entry fee, then they keep raising the entry fee, as long as you can afford to keep upgrading with the promise that you will make double or triple what was originally promised to you. I remember, I once signed up for a $9.99 system that wound up around $1,000 with POS upgrades or what they call OTOs [One Time Offers]. If you have ever done this, you will know that it takes over a year for you to realize any advantage for upgrading. What is bad about that is that they knew that all along. Anyway, you get the picture. Otherwise, if I keep going this will be a whole new book by itself. I am tired of my 9 to 5 job, waking up early in the morning to prepare for work, then going home late because of the traffic jam. I barely have time for my daughter! I tried to look for ways on how to earn money through the use of the internet, and this book popped up. 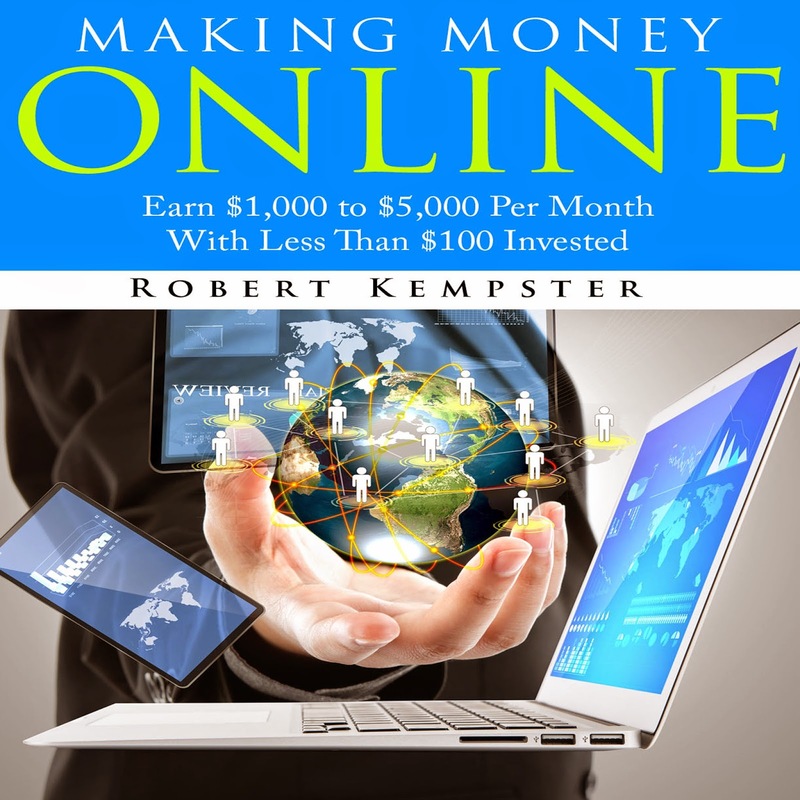 I have to say that this book gives out great strategies and tips on how to make money online. I never thought that someone could earn that big amount of money using the internet. Thanks to this book! It was really a big help! If you are looking to increase your financial standing in 2015, then this no nonsense guide by Robert Kempster can help you. “Making Money Online: Earn $1,000 to $5,000 Per Month With Less Than $100 Invested” is somehow both inspiring AND down to Earth, a hard combination for any book with ‘money’ in the title. That said, this one really does it, and it does it well. This is no ‘Get Rich Quick’ scheme, nor does it delve into Multi-Level Marketing. Instead, Kempster offers honest advice and methods that have been proven to work. From self-assessment to applying for online telecommuting jobs, Micro gig economies like FIVERR and the familiar blog and advertising routes, he runs the gambit of information, yielding much more than I can list here. Though the title indicates that funds just shy of $100 are needed, there is still valuable material to be mined here, and ways that you can start with nothing – today - and still earn some cash. As more and more of us escape the dreary day to day of office work, the online market beckons – offering potential careers to those willing to work for it. This guide is Step 1. Do you think your varied background, from science to art to economics, contributes to how you approach and write about making money online? Well, I would like to think that it does. However, it is a decision that has to be made by the reader; as you may very well know. Science seems to prepare you for logic, theory formulation, proof, and maybe a law or two. Science also has the effect of talking in absolute values, while Economics tames that beast by showing that things are more fluid than absolute. What is one of the biggest mistakes people make when turning to the Internet as a source of income? I think the biggest mistake people make is the same as with most human endeavors. We tend to wait until we absolutely have to make a move. Which means that you are attempting to make a career move under duress, at a point that you are facing a lay-off, or worse till at a point of joblessness. I have hired a lot of people in my corporate days, and I will tell you that all candidates at different levels have one thing in common - THE MORE CURRENTLY EMPLOYED THEY ARE, THE MORE EMPLOYABLE THEY ARE. In other words, if they are currently employed, they exude confidence, you get the feeling they do not really need the job, and that makes them more desirable for any employer. So on the side of a potential employer or customer - you will look more appealing the less needy you are. Also, on the part of the people turning to making money online - you are more alert, more realistic, and not desperate to the extent of falling for any scheme; when you make that move before you need to. As someone said, "Failing to plan is equal to planning to fail". By making career changes before you ever need to, you force yourself to make it a planned move. The added advantage is that you also have more choice in the decision, something you will not have once it becomes a forced move. I think the impact will very much depend on the people and what they do with the information that they get from reading it. If they spend the time to understand themselves and who they are, which they can do from resources within the book. If they identify what they are good at, if they develop a workable plan, and if they follow the week by week plan suggested in the book. Again, I am not saying the information is absolute, you may have to tweak it every now and then, but once you learn the process you can apply it to most things. "All things being equal - ceteris paribus" the impact for anyone that practices and execute the plans suggested in the book, should be income generation. Income that should grow as you put more effort and time into it. I am being asked by several Freelancers to write a book solely for freelancing and I am considering that move. Although, I was thinking more along the lines of Freedom From Debt. However, I think demand as we know usually determines supply. The only other thing I have to say about the book is that it is not all about what you know, and so it is not so much about what the book teaches, as much as what you do with it. This book has already helped me, by helping me to reorganize myself, and to realize that living in the moment is all about the future.